Universal is a multi-purpose restaurant HTML5 template with many useful options featured at ThemeForest and created by Enstyled. The layout looks very attractive, with stylish fading effects. You will be able to post photos of your most delicious meals on your homepage and have your visitors hooked on the eye candy instantly. You can post resized photos of your favorite dishes, and add small intro text, which after clicking on it, takes your visitors to a page where you can describe the meal in detail. You can also add your latest upcoming and past events and present them on the homepage with thumbnails, and by clicking on them your visitors will be redirected to the gallery where you can describe the event thoroughly. If you want to introduce your visitors to your restaurant, you can be as detailed as you want. The “about us” page gives you the possibility of representing your place to your visitors. The blog section will allow you to post as much as you want and bring the most important things about your restaurant closer to your visitors. 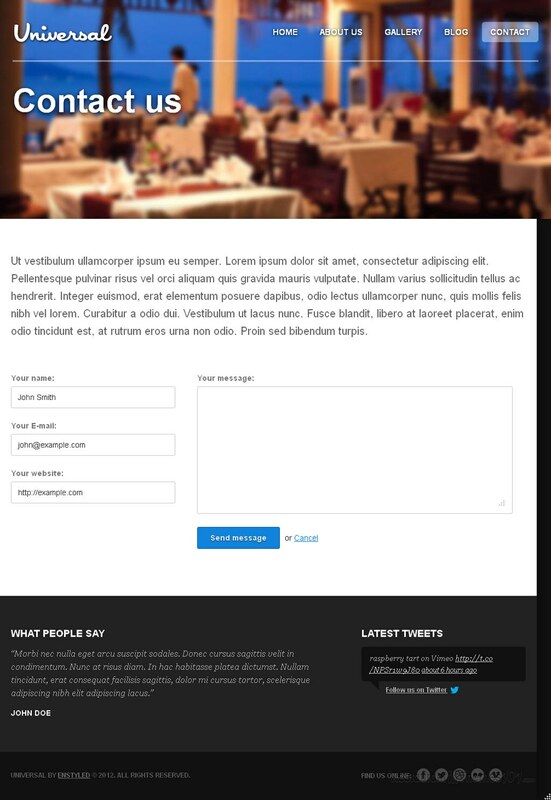 This template is very adjustable, and with customization it can perfectly fit any kind of a website, not just restaurants. The template is coded in HTML5 with the use of some sweet CSS3 features and animations. Customization is very easy and almost anyone can do it. All the effects degrade slowly so you can be sure the theme works fine on older browsers which aren’t supported with the latest tech innovations. You will also be able to use a wide variety of jQuery plugins because the jQuery framework was used for some elements and functionality of the theme. The theme comes with a layered PSD file so you can easily create custom images for the homepage features. Universal is a full responsive HTML5 restaurant theme so you can rest assure your website will look great no matter what device it is accessed from, including mobile devices.